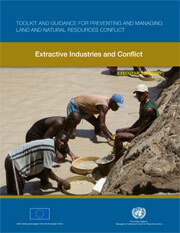 Extractive industries present particular challenges for both fragile states and developing nations; the exploitation of non-renewable natural resources, including oil, gas, minerals and timber has often been cited as a key factor in triggering, escalating or sustaining violent conflicts around the globe. Violent conflict is most likely to occur where local communities have been systematically excluded from decision-making processes, when the economic benefits are concentrated in the hands of a few, when the burdens associated with extractive industries clash with local, social, cultural, religious and environmental norms, or align with pre-existing tensions. The price paid by societies threatened by, undergoing or emerging from natural resource-related violence is evident in the lives lost or touched by conflict, and amplified by fractured relationships, weakened institutions and destroyed infrastructure. Steps can be taken to; prevent such conflicts from occurring; mitigate their short and long-term effects when they do occur; and, harness the enormous potential of natural resources to rebuild societies in the aftermath of conflict. The effective management of a society’s natural resources is therefore a priority for all those committed to the goal of conflict prevention and sustainable development.